Through the vision and talent of noted sports artist Al Sorenson, Big Time Footballs is proud to offer this truly unique hand-painted Wilson football featuring the of Denver Broncos’ Peyton Manning. Each football is different and an original piece of artwork. Any Broncos fan or fan of Peyton Manning will love having this truly unique piece of memorabilia art for their home or office. These fine specimens of art include the signature of artist Al Sorenson, and each is fully authenticated. Get one of these original pieces of amazing autographed art before they are gone. Due to the truly unique nature of this item we must charge your credit card for the full price immediately upon taking your order. This policy ensures we reserve a ball from the series for you. We will confirm your order by Email. This ball is not game used. Please allow 2 to 4 weeks for delivery. 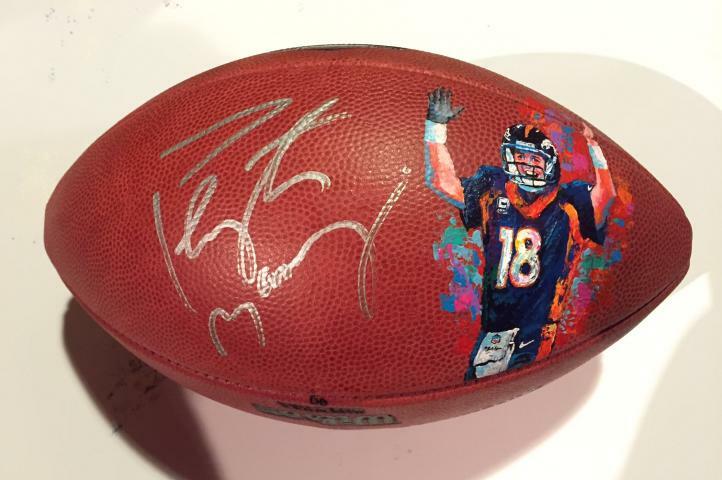 Peyton Manning Painted Football by Al Sorenson $1,395.00 Sold Out!